Summary: December 12 - A Cookie A Day Until Christmas! I'm taking suggestions for a new name for this cookie. I really just wanted to make some ganache, so I could say "ganache" over and over. Seriously, they need and deserve a better name. Help me! Cream butter and sugars. Add eggs and vanilla, mix until light and fluffy. Combine dry ingredients together and add to butter mixture. Divide dough in half and roll in long ropes. Spread chopped almonds on a cookie sheet and roll cookie dough in almonds, covering as much as possible. Wrap in plastic wrap and refrigerate overnight. Refrigerated cookie dough rolls should be about 2” in diameter. Slice cookies ½” thick and bake for 8 minutes at 350°. Prepare ganache by placing chocolate in medium bowl. Heat cream in microwave for 2 minutes on 50% power, stirring after each minute. Pour hot cream over chocolate and whisk until smooth. Allow ganache to cool and whip with whisk until light and fluffy. 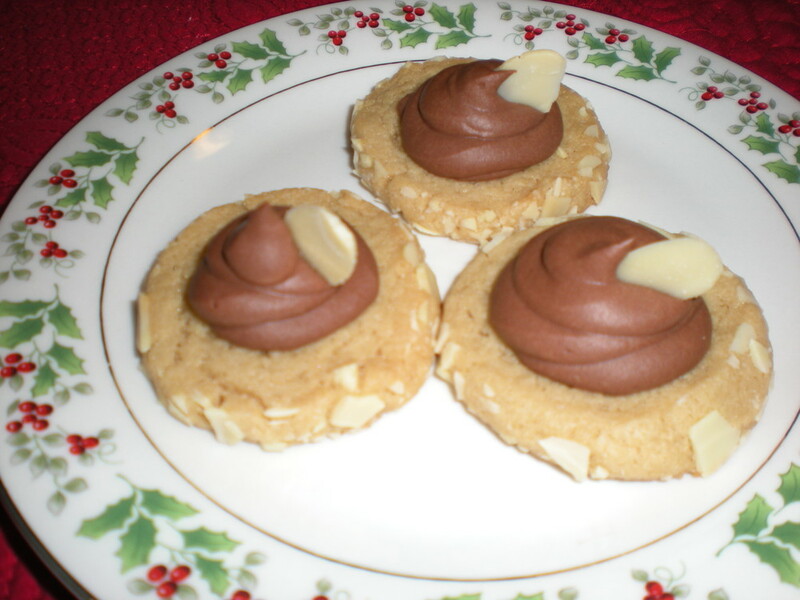 Pipe whipped ganache in the center of each cookie and garnish with a sliced almond. Allow ganache to cool slightly. Place cooling rack over wax paper and place cookies on rack. Spoon ganache over cookies, allowing some to run over the edge of cookies. Posted on December 12, 2010 by Karma in the Kitchen and filed under Cookies!, Desserts and tagged Chocolate Happiness Cookies!.